Field Day is the perfect signal that the end of the school year is near. With summer on the way, students look forward to an exciting and well-deserved break from the classroom. Here’s how to make the most of this tradition. Preparation is key to a fun field day that children of all abilities can enjoy. Secure Volunteers Early - No matter the size of your event, proper planning and having the support of a team is essential. Ask for a few key players early in the school year before calendars get too full. Generate Buzz - Build excitement for your event with plenty of announcements and reminders. This will not just boost participation, but help grow the number of volunteers that want to help. Having students make banners, pennants and decorations will help spread the word and encourage team spirit. Involve as Many People as Possible – Break down responsibilities into smaller, manageable tasks and see the power of teamwork. For instance, involve people for set up, game monitoring and clean up. 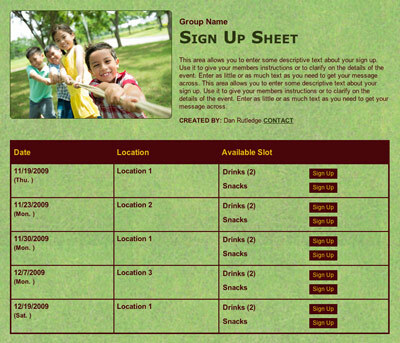 Genius Tip: Organize, invite and remind volunteers of your field day event with SignUpGenius. Decide How to Measure the Competition - Some field days seem all about the competition factor with participants eagerly awaiting their winning ribbons. However, depending on the age and type of group, rewards for participation, good attitude and sportsmanship can result in an even better celebration. Find the Right Challenge Level - Be sure to provide a variety of difficulty levels in your games and activities. Planning all activities at a high challenge level may be great for the super athletic in the group but extremely frustrating for others, especially younger students. Conversely, older students will lose interest without enough challenge. Keep an Indoor Rescue Plan in your Back Pocket - Mother Nature may prove fickle, so be sure to plan ahead with ideas for how the school hallways, gym or cafeteria can be transformed. Recruit Field Day volunteers with an online sign up! SAMPLE. Cones, jump ropes, tables, balance beams, tumbling mats and more creative objects can become ideal obstacle courses in the great outdoors, as well as inside if weather becomes an issue. Create Themed Obstacle Courses – Feeling creative? Try a theme to tie an activity together. Circus-themed courses for younger students may include activities such as balancing a ball on your nose like a seal, walking the tightrope (jump rope) and juggling. Have pirates walk the plank (balance beam) or zookeepers tame the wild animals (think hula hoops and small children). 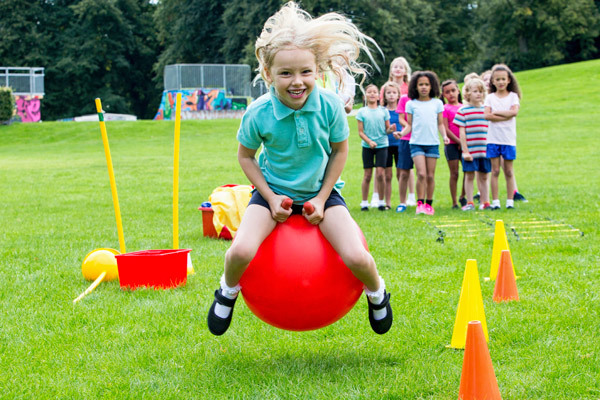 Add an Extra Challenge - Set up obstacle courses using cones, jump ropes and a variety of large and small balls. The catch? Participants must balance balls between their knees while maneuvering through the course. Do it in Reverse - After students have mastered the obstacle course in one direction, test their speed going backward, depending on the difficulty level and safety of the course. Crab Walk Through the Course - To increase the difficulty level, students must first sit, bend their knees, lean back on their hands and lock elbows in the position of a crab and then complete the course. Hunt for Treasure - This is an activity that will be harder to manage for large groups, but can be still be done on a class level. It’s also a great indoor activity if needed. Provide students with detailed maps and directions, as well as multiple routes to ensure all students are not on the same path. This is especially good for cooling off on those hot days at the end of the school year — water games are always a big hit. Just make sure to tell students to bring swimsuits or a change of clothes. Water Balloon Toss - Teams of two start about a foot apart and toss the balloon back and forth, then keep taking a step back until they miss. If you’ve ever been in charge of a water balloon game, you’ve probably learned the first cardinal rule: You can never have enough prefilled balloons. And secondly, they always take longer to fill than you think. Enlist as many volunteers for this task as possible. Wagon Race - Fill at least two child-size wagons overflowing with small water balloons. Each team must pull the wagon around a course set up in a zigzag pattern as fast as possible without spilling or breaking the balloons. Car Wash Relay - The first team member places a sponge in a bucket of water and runs to squeeze as much water as possible into a cup before returning the sponge to the next relay member. The team that fills the cup to the top first wins. Sponge Pass - Each team lines up with a bucket full of water and sponges placed at the front of the line and a second empty bucket at the other end. The team passes wet sponges over their heads to the end of the line where the last person squeezes the sponge into the second bucket and runs to the front to start again. Have two sponges going at the same time for extra fun. The team with the most water in the end-of-the-line bucket after their timed session wins. Balancing Act - Students lie down on their back while a volunteer places a paper cup of water (only half full) on their forehead. The goal is to sit up without spilling or using your hands. Gone Fishin’ - Younger students never seem to tire of “fishing” for inexpensive prizes in a kiddie pool. Fishing for small laminated and numbered index cards redeemed later for a prize can also be an easy option. Magnets attached to the “bait” will allow this idea to work best. Field days are a great way to get out all that extra energy that’s been bottled up inside the classroom. Combination Relay - Create a relay that combines short runs with a fun or silly activity. Ideas include jumping jacks, completing a somersault or blowing bubbles while hopping on one foot. Dress-up Relay - Divide students into two teams. Pile at least 10 items of clothing for each team on one side. Each player must “dress” as fast as possible, run to the next team member without any objects falling off, “undress” and pass the items to the next team member. Passing the Baton – Complete a relay race, but consider using another object of significance to your school such as a stuffed animal of your school mascot. Speed Relay - Don’t forget about the simple 50-yard dash. Mix it up by having students run backward. Balloon Stomp – Using yarn, tie a balloon to each student’s ankle at the beginning of the race. Opposing team members follow runners down a course trying to pop the balloon. Spoon Race - Students must balance an egg on a spoon to the finish line without splattering it. Substitute different items on the spoon for a less messy activity, such as small potatoes or grapes. Freeze Tag - This old favorite is still worth lots of laughs; encourage students to freeze in creative positions. Make sure Field Day set up is handled with an online sign up! SAMPLE. Try these for a great demonstration of stamina and coordination. Hula Hoop Marathon - See who can last the longest — variations may include around the middle, arm or leg. Hula Hoop Ring Toss - This activity will require a large open space to set up 15 to 20 cones. Students try to toss hula hoops over the cones. Start closer, and then move further back for more of a challenge. Frisbee Throw - Participants must throw Frisbees through hula hoops set up at varying distances and positions. Hula Hoop Teamwork - This can be used as a great teambuilding activity — or with two teams competing. Explain that the hula hoop must not touch the ground, nor can the circle of hands be broken. The person on one end of the line then places a hula hoop on a teammate’s shoulder and the group joins hands to form a circle. Each person must maneuver through the hula hoop without letting it touch the ground to move around the circle until it reaches the beginning again. Hula Hoop Soccer – Cut hula hoops in half and insert into the ground with dowels to create a fun course for students to kick balls through. Musical Hoops - Think musical chairs with hoops. If and when two students end up hopping in the same hoop, the student who touched a foot in the hoop first can stay. Hula Hoop Course - Create a winding course of eight to 10 hula hoops that kids must maneuver in and around while following specific instructions. For example, hop on one leg once for hoop No. 1, twice for hoop No. 2, etc. These activities are perfect for indoors or out and are sure to get your students in a mood to shake their sillies out. Group Dance - Set up areas where a brave volunteer teaches groups of kids different dances such as the Cupid Shuffle, Cha Cha Slide or the Chicken Dance. Dance Contest - Depending on the time slot available, it could be based on endurance or skill. Freeze Dance - With all participants on the designated dance floor, choose a random time to pause the music and have kids freeze in position until someone moves and gets out. Repeat until one dancer remains. Copycat Dance - All participants stand in a circle and someone starts with an original dance move. The next student copies it and adds her original move and so on. Limbo Dance - Students must see how low they can go while simultaneously doing different dance moves. Plan Teacher Appreciation Week with an online sign up! SAMPLE. Outdoor field days are the perfect opportunity for those extra messy crafts. Finger Painting - Set up craft stations where students can participate in various finger painting art projects. Sidewalk Chalk - Students can create drawings or games such as hopscotch or Four Square. Paint with Bubbles - Mix prepared bubble mix with a few drops of watercolor. Have students blow colored bubbles onto paper to create their masterpieces. Tissue Collage - These are great for individual or group projects. Students attach small tissue paper squares to a poster board by brushing a glue mixture onto the board (glue solution is prepared by mixing ½ cup craft glue and ¼ cup water). Let it Drip - Art projects involving squirt bottles and acrylic paint and/or watercolors can produce many fun results. Consider drip painting objects such as flower pots and craft boxes. Paint with Marbles - Students can create some amazing abstract art by rolling marbles around in paint and onto their paper. Leaf Prints - Let your students use nature as their inspiration. Use leaves they have collected themselves if possible. Pool noodles easily lend themselves to a variety of games and races. And because they are so inexpensive, it’s an easy item to get donated for your field day. Pool Noodle Ring Toss - With long sticks or pegs and some duct tape, pool needles can be cut to form everything you need to create rings to toss, as well as the targets in the ground. To make your rings, form your noodles into circles and tape tightly. Then push sticks into ground and place the cut pool noodles over the sticks. Noodle Obstacle Course - Bent and secured noodles make great hurdles for jumping over and climbing under with the extra benefit of being so soft. Noodle Sword Fight with Bubbles - In teams of four, give two students a noodle to use as a sword and the remaining two the job of blowing bubbles and counting the winning number of bubbles conquered. Noodle Tower - Build a pool noodle tower with blocks cut out of noodles and then come up with creative ways to knock them down for points. Noodle Relay - Students must balance noodles between their knees or on top of their hands while racing to the finish line. The key to a fun Field Day is throwing in a mix of games and activities since children inevitably have varying tastes. Make sure there’s something for everyone, and this year’s Field Day will be one for the record books. This is amazing all of my kids at my school have enjoyed doing these activities and having a break from school life. I recommend this for people that works at schools or at tuition places.100% agree with myself......HAVE FUN!!!!!!! These are great ideas !!! by 100%!! 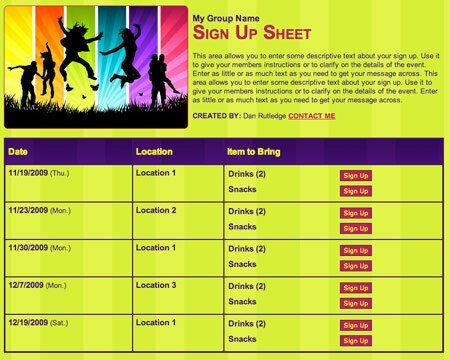 It makes it easy for the coordinators of the event to ask for help but even easier for parents to sign up!! These events sound like so much fun. It brings back a lot of great memories from my own childhood Field Days! Create a classroom wish list using an online sign up!